Rapper Li'l Wayne probably didn't realize how much the phrase "bling bling" would impact on the entire hiphop culture when he first used it in his 1998 track 'Millionaire Dream'. Now, it has even crossed over to the hip toy culture. 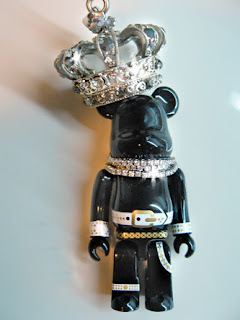 Featured in the picture is Series 13's 'Skull' Be@rbrick, wearing a crown from a Bangkok bling vendor and real South African diamonds around its neck.